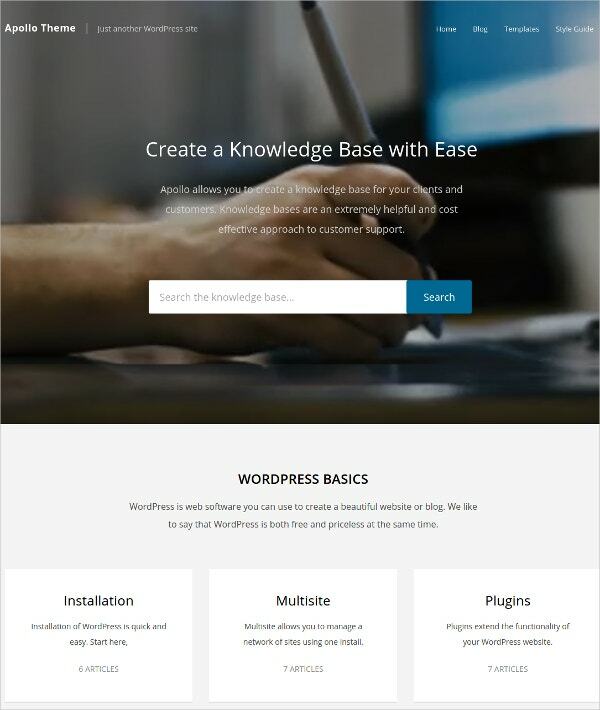 Knowledge Base WordPress themes are templates for WordPress which are built with a specific purpose in mind. These templates are custom-built to let you create a knowledge base or a wiki. Such templates should let you create mobile friendly wikis with easy customization options. The following Responsive WordPress Themes were designed keeping in mind the special requirements of a knowledge base. An important feature to look for in such a template is support for multiple languages, preferably both RTL and LTR languages. 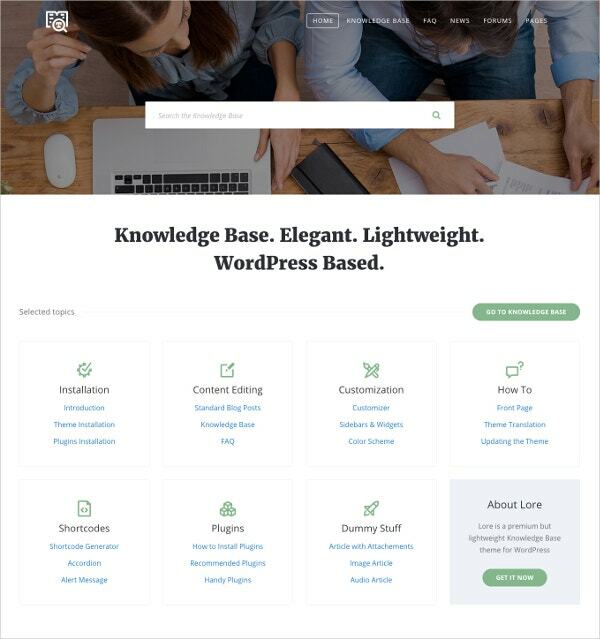 Lore is a simple and elegant knowledge base template that is lightweight and easy to customize. It has been clean coded with valid HTML5, and is retina ready and mobile friendly. The template has support for bbPress plugins, which is used for forums. It offers support for RTL languages and is easy to localize because of compatibility with WPML. 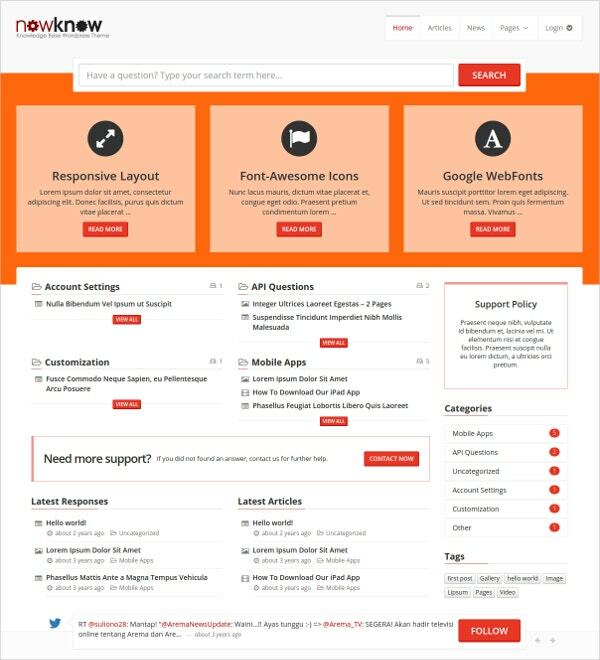 DW Helpdesk is a WordPress theme with bright colors and crisp typography. It is designed specifically for helping you to address and solve customer support issues. It can be used to set up FAQs, knowledge bases, glossary, question and answer type pages etc. Features include four premium plugins – DW Glossary, DW FAQ, DW Question & Answer Pro and DW Knowledge Base Pro – which are worth over $80. The template is responsive and retina ready. 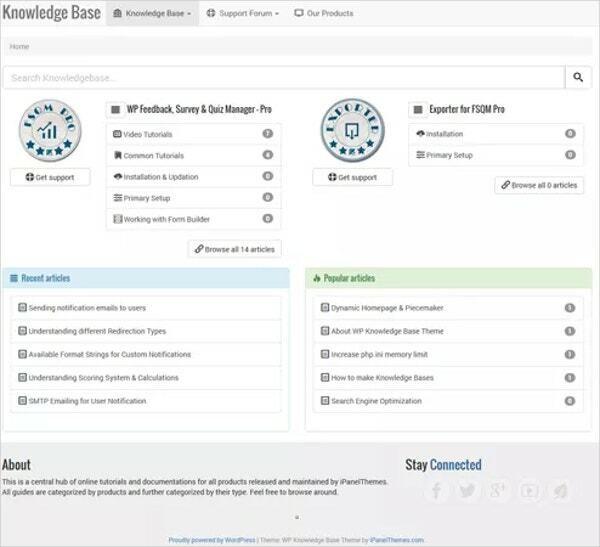 WP Knowledge Base is a bootstrapped theme is specifically designed to help you maintain a knowledge base for multiple products. You can quickly set one up with only categories and posts, though the theme supports forum links, images, icons etc. The template is built on Bootstrap 3, so you need at least WordPress 3.5 (which supports jQuery on which Bootstrap 3 depends) to use it. Helper is a theme with a highly customizable layout. The Visual Composer plugin is a powerful drag-and-drop page-building tool that is included with the template. It is built on the Redux Famework, and the theme options panel makes customization very easy, with over 300 options. Other features include Google Analytics integration, Contact Form, over 500 Google Fonts, unlimited colors and more. 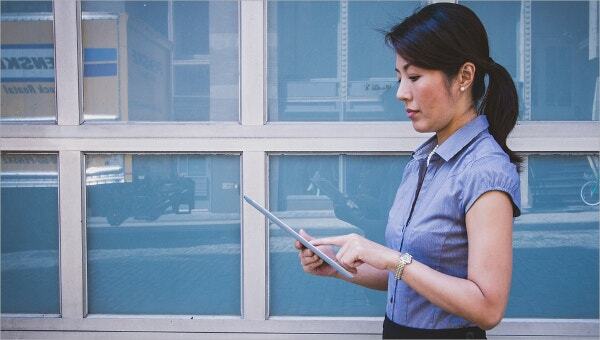 KnowAll is a theme that aims to stand-in for you before your customers when you’re not around. It lets you offer support 24/7, and makes it easy to build a powerful customer support platform. It can be customized without coding knowledge. The powerful analytics dashboard lets you monitor traffic, understand your visitors better and customize your content accordingly. It is translation ready, widget friendly and comes with a 30-day money back guarantee. 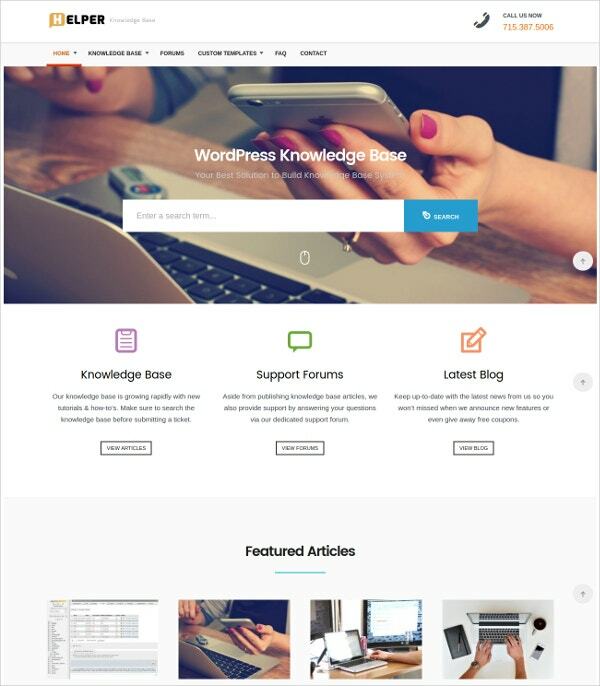 The KnowledgePress WordPress theme makes it easy to build a knowledge base for your customers in minutes. It comes with features like a drag and drop article and category reordering function, breadcrumbs, visual page builder, FAQ plugin in the accordion style, live search widget, placeholders and more. It also includes plenty of other offerings such as Favicon and logo, voting capability, archive pages, multiple layouts and more. 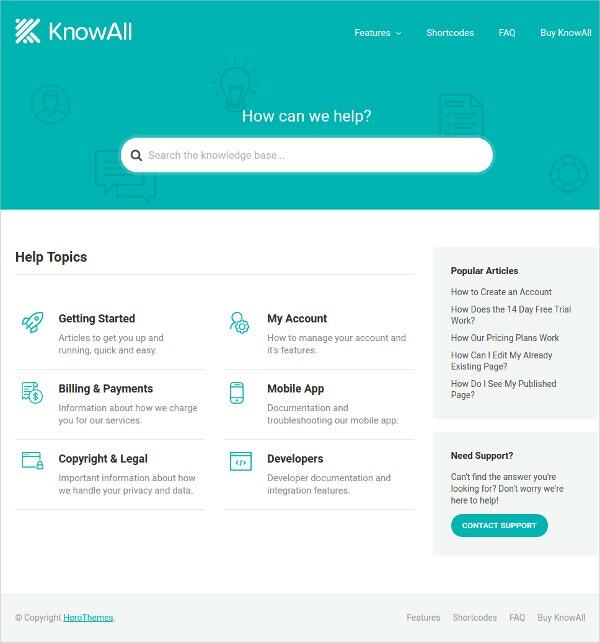 NowKnow is a friendly-looking template with bright colors and HTML5 plus CSS3 and bootstrapping for responsive, lightweight websites. It is compatible with WordPress 3.6 up to WordPress 4.2.2. It comes with live search, multiple post format support, several page templates to get you started, localization support, custom widgets, custom shortcodes, Font Awesome fonts, jQuery Mobile Menu and more. 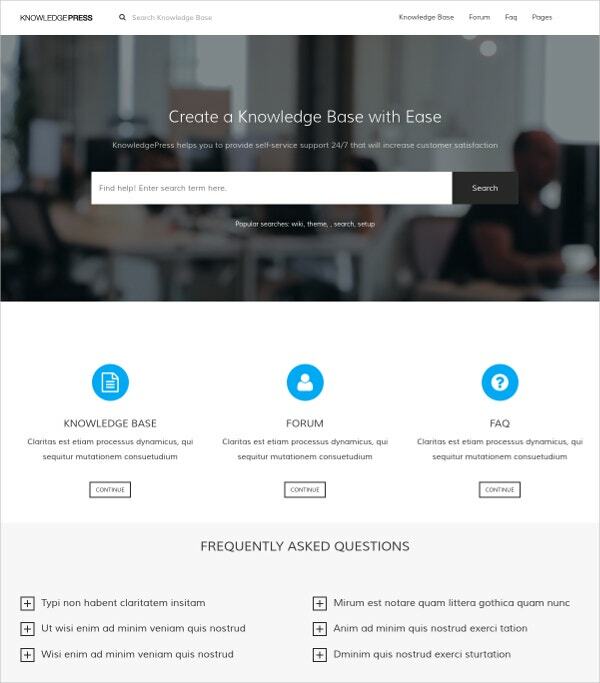 Knowledge Base themes should make it easy to set up questions and answers for your readers. Some of these themes offer advanced features that make ordering and managing your wiki or knowledge base easy. 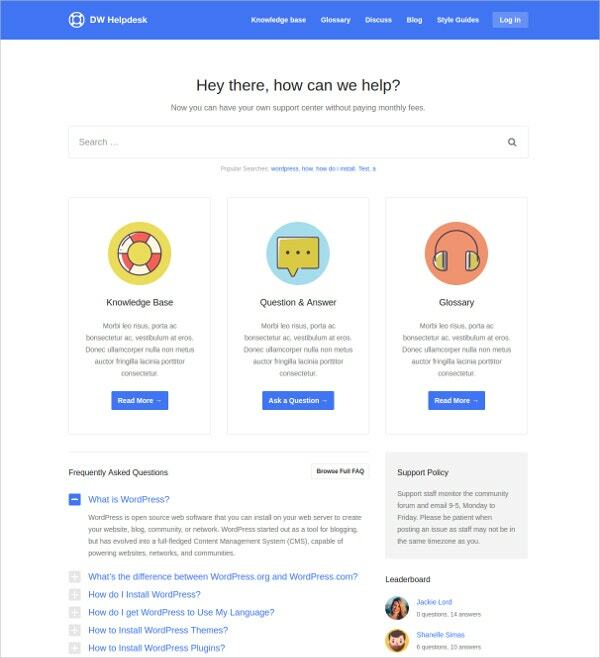 Overall, the Question & Answer WordPress Themes should help you offer your customers a place to turn to for having their queries answered when you are not accessible.